How many runs do you do in a day? Can I bring my snowboard? Where are the most reliable places for weather? ​Are there discounts for groups or bonuses for signing new heli-skiers? Heliskiing is generally very safe. However, there will always be a degree of inherent risk (as there is driving a car) that is impossible to elimintae entirely. Our number one priority is your safety. Without exception, we and our partners follow the strictest safety guidelines and operational procedures. We only work with reputable helicopter companies who have excellent safety records and follow internationally recognised maintenance procedures. Pilots are experienced mountain aviation specialists and guides are highly qualified and experienced professionals. 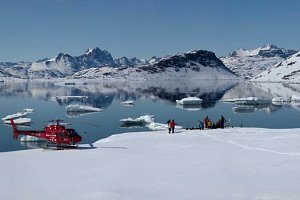 With the exception of some of our Alaskan destination you will always heliski with a guide who is certified by the UIAGM or the AGMG (the recognised international and Canadian Moutain Guides Associations. This means they have been examined to the highest standards and are seasoned professionals with many years of experience. The guides continuously monitor weather and snow pack information with the aim of balancing exciting powder skiing with the highest possible levels of safety. If you have any specific queries regarding the safety measures in place at particular locations, please do not hesitate to contact us. The number of groups sharing a helicopter, the average run length, the group size and its ability, all influence the number of runs and amount of vertical metres or feet you will heliski each day. That said, if you took an average across all destinations, it would be 8-10 runs per day with an average of around 900 vertical metres per run. In the European Alps you tend do do far fewer (but longer) runs - usually only one or two per day. At the opposite end of the extreme you could expect to make 10-12 runs per day in British Columbia each averaging around 800-900 vertical metres. Kamchatka has some of the longest runs with many over 2,000 vertical metres. Heli skiing is not for novice skiers. However, it is not just for the pros either. If you are a strong intermediate skier in reasonable shape and are able to tackle most runs at a resort with confidence and in most conditions (irrespective of style),you are good enough to heliski. With modern fat skis powder skiing is A LOT easier than it used to be. You have considerable skiing experience in a conventional resort setting. Your run choices are predominantly red/black and you ski them with confidence in almost any conditions. You are capable of multi-day ski trips. You may not have the style of a paid skier, but you have the confidence to keep up with friends. You can make parallel turns with confidence and if the situation arises, you can; side-slip, step-up sideways, traverse and make kick turns. In the process of becoming a better skier, you have made the transition from novice level equipment to high performance gear and can also recognise the difference. You may not have a lot of powder skiing experience but you can maintain control in off piste conditions. YES. The term heli-skiing is used interchangeably with heli-boarding. If you want to snowboard you will usually need to bring your own equipment. Every heli-ski location has its own particular geography and meteorology that influences the length of the season. In Canada, December, January and the beginning of February are typically colder and the days shorter than later in the season. As temperatures remain cooler early on, conditions at lower elevations often provide excellent tree skiing in poor visibility. Mid-February through to mid-March has historically been the most popular time for heli-skiing and for some of the more popular locations it is necessary to book up to a year in advance to secure space. By spring the days are longer and the weather tends to be more reliable with less precipitation. Late March and April offers skiing and boarding conditions, which have always been under-rated. This is often the time of year that offers optimum conditions for heli-skiing. The conditions from day to day in April tend to change a lot faster. The snowpack is usually more stable at this time of the year making it safe to ski/snowboard steeper runs and experience a wider variety of terrain. Typically you find excellent powder at higher elevations and on north facing slopes and more spring like conditions on more sotherly aspects and at lower elevations. If you want to get out onto some of the big alpine and glacial runs, this is the best time to come. The seasons in Alaska, Kamchatka, Iceland and Greenlandare shorter (mid-February to early June) due to lack of daylight and poor weather earlier in the season. Powder conditions in all these places can be excellent right through into late April and even May. The southerly latitudes of the Caucasus in Russia and the Himalayas in India also make for a slightly shorter season. Both seasons generally start around mid January and end in early April. By April you are usually skiing good powder at higher elevations on north facing slopes and velvety corn snow on south facing slopes. Adverse weather conditions can affect your trip to varying degrees depending to a large extent on factors such as the elevation of tree line and the distance to the first runs from the base. A big part of minimising the risk comes before you even travel by choosing somewhere that statistically has a low incidence of 'down days'. If the weather is so bad that the helicopters cannot fly (which at most locations is rare), the majority of operators have a refund policy in place, which minimises your financial risk. If you do not reach the amount of skiing included in your package (usually 30-40 runs per week or 30,500 vertical metres / 100,000 vertical feet) you will be refunded a certain amount (typically around $150 / 1,000 m). In general terms, British Columbia is the most reliable place to heli-ski as it is here that you are least likely to be adversely affected by poor weather. Generally speaking, interior ranges have better weather than coastal ranges...so for example, the Canadian Rockies would have significantly more sunny days than the Chugach Mountains in Alaska but they also get significantly less snow and tend to suffer from persistant avalanche problems that can significantly reduce the amount and quality of ski terrain you can access. The real advantage of coastal climates is that they tend to produce a snowpack that is more stable and more predictable in terms of avalanches. As a result you can ski or ride steeper line more safely and guides are generally less conservative in their terrain choice. In terms of suitable flying weather and lack of ‘down days’ British Columbia in Canada is generally the most reliable worldwide heliski region. Yes. There are a range of different benefits available for bringing a group of a certain size but these will vary from one destination to another and at some locations it is not possible. We also actively encourage referrals from our clients. Introduce your friends and you will receive a credit towards your next heli-skiing adventure. For every new skier that books a seven or five day heli-ski trip with EA Heliskiing, you will receive a £200 credit. This can be used as payment towards any heli-skiing adventure offered by us for the following three seasons. For a list of our current heliski special offers please contact us. EARLY. We recomend that you book 6-12 months in advance to maximise your options. Later bookings and even last minute bookings are always possible but the choice of destination and dates will be limited. Groups are chosen with three factors in mind: ability, weight and who you are traveling with. Every effort is made to have you ski with member of your own group but if there is a great discrepancy in ability it is usually in everyone's interests to split. The best way to ensure that you are only skiing/snowboarding with your friends is to choose a private package. This means that you have a helicopter exclusively for the use of your group allowing you complete freedom to ski or board as much or as little as you like and entirely at your own pace. We guarantee you that we have the best prices available. If you find any trip on this website at a lower price we will beat it. Remember that booking with us will never cost more than booking direct with a lodge. In fact, it will often save you money and you will benefit from our first hand knowledge and expertise combined with honest, impartial advice and unrivaled personal service. All of the prices on this website are quoted in local currency but we accept payment in GBP, Euros, Swiss Francs, USD or CAD. The space available for heli-skiing is limited and we suggest that you book early. For some destinations and in prime weeks it may be necessary to book up to a year in advance. When you have chosen where you would like to go, please contact us to check availability. If space is available we will issue you with a deposit invoice, a booking form and detailed trip information and hold your seats for a maximum of seven days pending the receipt of your completed booking form and deposit. Deposit amounts vary significantly from one destination to another but generally they are between 20 and 30% of the total trip price and are strictly non-refundable. A booking can only be confirmed with a deposit and a fully completed booking form. We accept payment by bank transfer, cheque or major credit card. However, credit card payments will incur a 2.6% charge. Full payment for your trip is required 95 days before departure. Adequate insurance covering you specifically for heli-skiing is ESSENTIAL. At a minimum we recommend your cover includes: trip cancellation, medical, helicopter evacuation and personal effects. Please visit our insurance page for more details. Fully customisable private heli-skiing packages are the ultimate way to enjoy heli-skiing. With our extensive worldwide network of guides and helicopter companies we are able to customise private heli-ski charters almost anywhere in the world where it is humanly possible. We recommend that you take a shell-type jacket and trousers that are waterproof and windproof made from a material such as Gortex. This will enable you to add or take off layers and adjust to changing temperatures through the day. Ideally your first layer should be breathable so you do not stay wet if you sweat. A pair of gauntlet gloves is useful when cinched around your forearm as they let no snow in. Good goggles are essential as is a warm hat. Even on sunny days you will probably find goggles more suitable than sunglasses and it is usually worth carrying a spare pair so if one gets filled with snow, you can simply swap. Your own ski boots (preferably worn in) should ALWAYS be taken with you, and in countries where baggage handling issues may arise (Russia, India) it is advisable to carry your ski boots as hand baggage. However, with heightened security measures in place at many airports you may find that your friendly ski boots are classified as deadly weapons capable of bringing down a plane. Fat powder skis are included in most standard heliski packages. Notable exceptions would be: Kamchatka, Alaska, Sweden and Greenland. As an EA Heliskiing client we are able to offer you excellent deals on K2 Skis if you wish to purchase a pair. Snowboarders are recommended to bring their own snowboard and boots in all cases. To give some protection to your ears against noisy helicopters, a pair of simple ear plugs (available at any pharmacy) are a good idea.